New alumni mentorship program aims to support undergraduates. A financial-aid initiative and other College programs help first- generation undergraduates feel at home. Not every first-generation student’s experience at Harvard is as dramatic. But the sorts of challenges many of them face—ranging from more acute academic and financial pressures to social/cultural isolation to a general disconnection between their lives at Harvard and at home—are complex enough to warrant a new Shared Interest Group (SIG), First Generation Harvard, which aims to increase alumni and institutional support for these undergraduates (defined as those whose parents did not graduate from a four-year college or university). The focus group also showed that many students feel immense pressure around family finances, or expectations/reactions at home. Jennings worked 20 hours a week, often sending money to his mother. “Kids who were the family earners actually feel guilty about being away at school,” he reports. 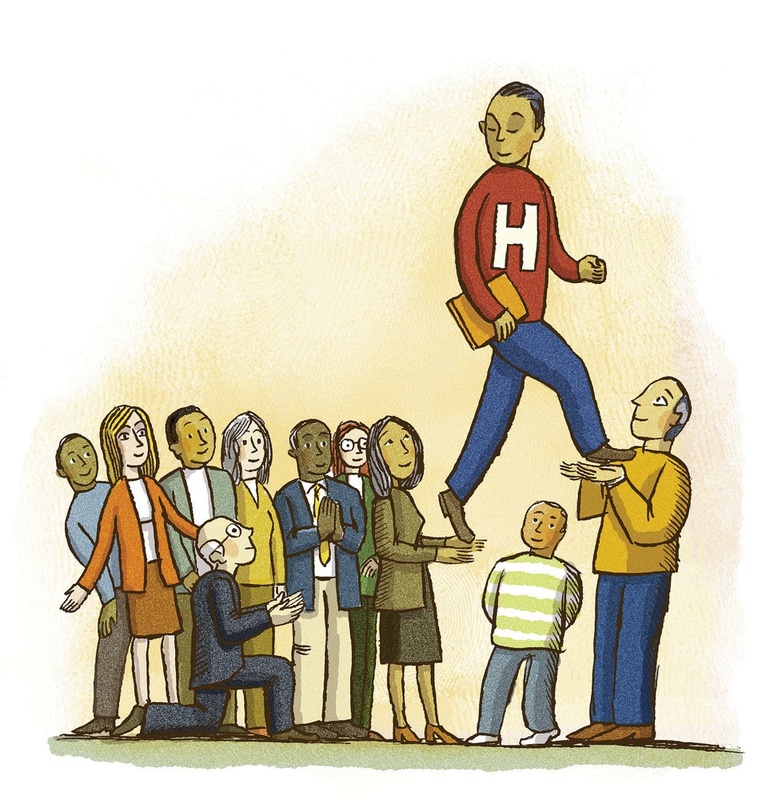 Some first-generation students hide the fact they go to Harvard when back in their old neighborhoods, wary of arousing envy or even hostility. “Going to Harvard definitely created a disconnect between me and people back home,” says Wood, who also sent money to her family during college. “Whereas classmates could find communities of selective-college grads among their family and friends, I felt like I had been placed on a pedestal as ‘the girl who went to Harvard.’ It was and still is a tremendous responsibility.” This summer she worked as an education pioneer at the Broad Center, a Los Angeles-based organization that recruits, trains, and supports leaders to help transform urban school systems. At Harvard, Appel had three roommates, all legacy students, including one from New York City and another whose father was a governor. One of them asked if she lived in a trailer. She learned of the classification “first-generation student” only when an upperclassman tapped her for a series of interviews on the subject. She remembers “crying during that, realizing for the first time that that’s why I was different.” She is now following a long-time dream of becoming a teacher through training at Teach For America in Mississippi. Much of her new practical knowledge has come from her international host family in Boston, whom she has found invaluable. Kevin Mulcahy is an Irish native, and Diane (McPartlin) Mulcahy ’88, M.P.P. ’94, has the College experience to guide Duggan, helping her acclimate not only to America, but also to Harvard’s idiosyncrasies and social structures. The couple also helped her get an internship at a writing organization, which led to her becoming a student proctor at Harvard Summer School. For Luis Ubiñas, whose son is applying to Harvard this year, the goal is much less about changing others’ views of the “invisible minority” or increasing external support services. “I would like a narrative to be established in the minds of these students that there is something special about being the first person in your family to go to college, to Harvard, and you should not let it pass,” he says. He maintains that the financial aid he received from Harvard and other institutions is a form of trust that he took very seriously and that he has worked harder in light of it.